Innovative ideas for teaching a successful music fundamentals program. 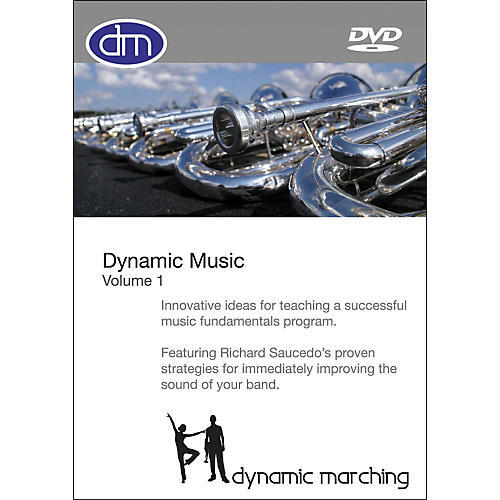 Join world-renowned composer, arranger, teacher, judge, and clinician Richard Saucedo in the Hal Leonard Dynamic Music Volume 1 DVD as he guides you through a system of teaching music fundamentals that has earned acclaim and success at both the state and national levels. Dynamic Music: Volume 1 will provide you with a clear and proven method for teaching the basics of posture, breathing, sound production, and ensemble listening skills. This system is built upon years of experience helping musical ensembles to achieve wonderful, rich, sonorous sounds and is not limited to the marching band genre. Chapters include: Philosophy of Teaching, Breathing, Sound Production, and Listening in the Ensemble. Get Richard Saucedo's proven strategies for immediately improving the sound of your band when you order today.